Most companies pay dividends each quarter, but not all stocks pay on the same schedule. In any given quarter, companies might pay dividends in each of the three months. Many dividend stocks will pay their 2018 third-quarter dividend in August. Since they pay in August, they will also pay in November, meaning investors are set to collect two dividend payments before the end of the year. Starbucks (SBUX), AT&T (T), and General Mills (GIS) are three examples of dividend stocks that will pay dividends in August. They also have strong brands, competitive advantages, and growth potential, which makes them high-quality dividend growth stocks. Starbucks has a current dividend yield of 2.3%, which might not be too exciting for income investors. This yield is only slightly higher than the average dividend yield in the S&P 500 Index, which currently stands at 2%. However, Starbucks makes up for a low yield with high dividend growth rates. On July 26th the company increased its quarterly dividend by 20%, to $0.36 per share. The new quarterly dividend will be paid on August 24th, to shareholders of record on August 9th. With the increase, Starbucks’ five-year dividend growth rate is 28%, which makes Starbucks a highly attractive stock for dividend growth. Starbucks can provide such high dividend growth rates, because of the company’s strong earnings growth over the past several years. It has continued to grow so far in 2018. Over the first three fiscal quarters, Starbucks reported 2% growth in comparable sales, which measures results at locations open at least one year. The number of transactions has declined to start the year, but Starbucks has a unique ability to raise prices on a regular basis. Starbucks is also aggressively opening new stores to fuel growth, particularly in the emerging markets. Starbucks expects 2,300 net new store openings for fiscal 2018. China is a key market for the company moving forward. 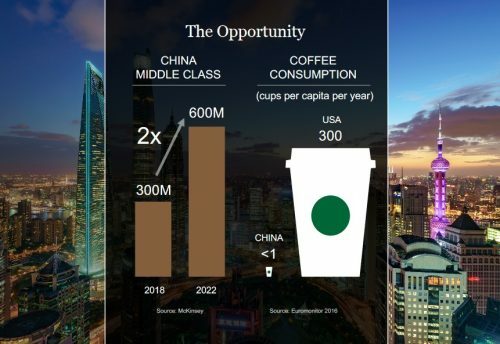 China is a major growth opportunity for Starbucks. The Chinese middle class is expected to double by 2022, to 600 million. In addition, coffee consumption in China is currently very low. While the average American drinks 300 cups of coffee per year, the average Chinese consumer drinks less than 1 cup. Starbucks believes it can change this, and as a result has made China a focal point for future expansion. Starbucks announced plans to build 600 net new stores each year in China over the next five years in Mainland China. This expansion will double Starbucks’ store count from 2017-2022, to 6,000 across 230 cities. For the full year, Starbucks expects adjusted earnings-per-share in a range of $2.40 to $2.42; at the midpoint of guidance, the company expects earnings-per-share growth of 17%. Starbucks stock trades for a reasonable price-to-earnings ratio of 21.8. Even if the stock valuation remains flat, Starbucks will generate strong shareholder returns. If the company grows earnings by 12% per year, total returns could exceed 14% per year over the next five years. While Starbucks is a high dividend growth stock with an average yield, telecom giant AT&T is virtually the opposite. It grows its dividend at a fairly low rate—around 2% to 3% per year—but it has a high current yield of 6.2%, which makes AT&T a highly appealing stock for retirees. And while AT&T’s dividend growth rate is not overly impressive, the company does have a long history of dividend increases. In fact, AT&T has increased its dividend payout for over 30 years in a row. This makes it a member of the exclusive Dividend Aristocrats, a group of 53 stocks in the S&P 500 Index with at least 25 consecutive years of dividend increases. 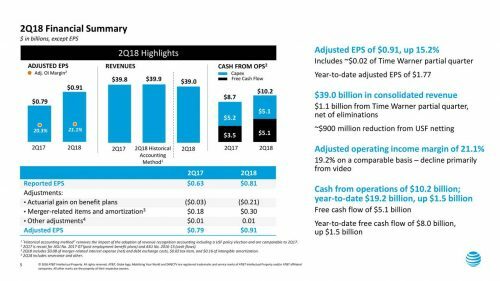 AT&T can afford such a generous dividend payout because it has huge competitive advantages, and a highly stable business model. AT&T is one of the largest telecommunications companies in the U.S., with a variety of services including wireless phone and Internet, along with cable and satellite television. On 7/24/18, AT&T reported mixed second-quarter financial results. Revenue of $38.99 billion fell by 2.1%, but adjusted earnings-per-share increased by 15% and operating cash flow increased 18% from the same quarter a year ago. AT&T has a long runway of growth up ahead, as the company is wrapping up some major acquisitions. AT&T completed its $81 billion acquisition of media giant Time Warner Inc., which will make AT&T into a content giant. Time Warner owns several huge media properties, including TBS, TNT, HBO, and the Warner Bros. movie studio. The deal will provide AT&T with a diverse new revenue stream and provide it with a valuable hedge against rising content costs. AT&T will also acquire AppNexus, for approximately $1.6 billion, which will boost its advertising and analytics platform. These deals will help AT&T continue to rake in huge amounts of cash flow, which finances its hefty dividend to shareholders. AT&T stock seems to be significantly undervalued, particularly if its earnings growth accelerates moving forward. With earnings-per-share expected to reach $3.45 in 2018, AT&T trades at a price-to-earnings ratio of just 9.3; expansion of the valuation multiple could generate 7%-8% annual returns for shareholders. In addition, the stock has a 6.2% dividend yield. AT&T’s dividend is a key part of its shareholder returns. Assuming 6%-7% earnings growth each year, AT&T’s total shareholder returns could exceed 20% per year over the next five years. Food and beverage giant General Mills has had a rough year—the stock is down 22% year-to-date and has deeply under-performed the S&P 500 to start the year. Investors have turned negative toward General Mills, due to the company’s slowing growth and inability to respond to changing consumer habits. These challenges were evident in General Mills’ most recent earnings report. For fiscal 2018, organic sales and adjusted earnings-per-share were both flat. The major culprit for General Mills’ poor performance is yogurt, led by its Yoplait brand. General Mills saw its U.S. yogurt sales decline by 12% for the full fiscal year. In response, the company is turning to acquisitions to boost growth. General Mills will expand its brand portfolio even more after the $8 billion acquisition of Blue Buffalo. 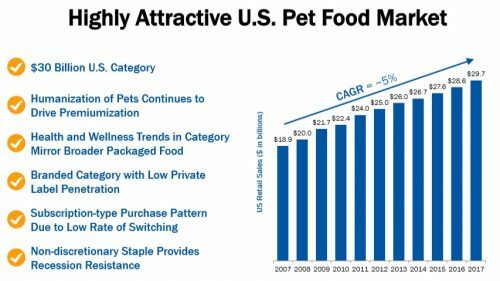 This huge deal gave General Mills access to the large-and-growing pet food market, a $30 billion industry that has grown at a 5% annual rate over the past 10 years. General Mills has also expanded into organics, with the $820 million acquisition of Annie’s in 2014. General Mills expects its natural and organics portfolio to reach $1 billion in sales next year. General Mills still has plenty of strong brands in its portfolio, a few of which include several prominent cereal brands, Haagen-Dazs, Betty Crocker, Pillsbury, Old El Paso, and more. While the stock has not rewarded investors in 2018, investors buying in at the current price could earn strong returns over the next several years. Because the stock has declined over 20% this year, the dividend yield has risen to 4.3%. This is a high yield, more than double the average dividend yield in the S&P 500. And, General Mills can continue to increase its dividend regularly, as the company is highly profitable. General Mills has increased its dividend for over 10 years in a row and has paid dividends for 118 years. The other major benefit of a falling share price, is a much more attractive valuation. Based on fiscal 2018 earnings of $3.11 per share, General Mills stock trades for a price-to-earnings ratio of 14.8, a reasonable multiple for a high-quality company. Even if General Mills grows earnings at a relatively slow pace, the stock can still be rewarding for investors, based on its low valuation and high dividend yield. The combination of valuation expansion, dividends, and earnings growth could yield total returns of 10%+ each year over the next five years.